American taxpayers spend billions of dollars keeping prisoners locked away (where they receive free medical treatment). The United States has more citizens behind bars than any other nation. And it costs us a lot of money to keep them there, keep them fed, healthy, and secure. Yet, for the law abiding citizens we cannot afford basic health coverage. WHERE IS THE JUSTICE? We have now sunken to a new low. We are now using ObamaCare to villify Christianity and saying someone is less of a Christian if they disagree with ObamaCare or simply refuses to comment. Whatever happened to the America I once knew? Our founding fathers are probably rolling over in their graves!!! So disappointing that someone like John Blake would write such a foolish piece of crap! Spot on......leave it to CNN to try and bail out this debocle . How about they mention the forcing of Churches under Obama care to cover abortions which goes against their religion . Don't want the churches speaking about that. So lets run this article. I have not seen anything that suggests "churches should perform abortions". Once again things just 'get made up'. Ignorance is a stinky cologne indeed. I love when church people rant. The funny thing is, if the Churches and Christian Communities were doing what the bible said instead of building bigger and bigger Churches, there wouldn't need any Obamacare. Sorry just can't blame the Christians, it reminds me of rich Liberals to who act like they care, but don't give up their millions to help the poor, becuase if they did we wouldn't need Obamacare either. So let the hypocrites speak! If Christians and other believers don't take a stand on this issue, then who can we expect to? If the US would keep its nose out of the Mideast and other locations, where it doesn't belong, and take care of the citizens of the US, there would be plenty of money to allow all to obtain a basic need and to rebuild the crumbling infrastructure of this country. The US is becoming a Banana Republic of the first order. Papa Doc would be proud! Pure Bull! The poor will continue to use the emergency room while everyone else has to pay more. Obama has turned this nation intoone of third word status. One can argue the merits of forced coverage and those not covered (fair enough). To not have a viewpoint on a subject is weak however. Catholocs, Pastors, Imams, etc are all like the mafia. They want you to buy in to their thinking. Sadly, many of those who actually follow and serve are "cast out." Remember only one thing: It won't be you or I making judgement when the time comes...But, it will come. Typical of the hypocrisy of Bible-belt Christianity. Or should I say pseudo-Christianity. WWJD is a cute phrase but hardly put into practice socially by these folks. You sure wouldn't find Jesus strolling around on the stage of a multi-million dollar church and living in a big mansion. Osteen wont speak out he needs his millions of dollars in donations to stay in his mansion so he speaks the words of people like the Kochs who don't care about poor people. Just don't care, if you are poor automatic you are lazy shiftless bum. Maybe there would be some jobs if politicians would stop coming to Washington to start their next campaign and actually come to govern. They also don't talk about the thousands that can't afford proper air conditioning which in the summer kills many elderly people in the south. They also don't talk about the thousands in their congregation who misuse the many government assistant programs. This is just more CNN propaganda. They got their marching orders for the week from the Obama administration and these are the type of articles they produce after they receive such memos. Two days ago they stated the have reporters standing by to help people get signed up for Obama care. The posted no contact information for said reporters but did report several success stories. I want the contact info so I can get signed up! If you are going to say you have reporters standing by then they should be available to do what you are promising in your article. Or as part of your orders are you supposed to cover up lies with more lies? Jeez, you computer doesn't have Google? Do you need someone to do it for you, too? Are you that lazy? Why aren't they speaking out? Maybe because the religious right is about as far from true Christianity as you can get. or so the media says. Maybe if some people actually spent time in various churches they might see that 99.9% of the churches and parishoners are very good people who spend a lot of money and hours to help those who are disadvantaged in various ways. I've seen local churches in our area help peole with everything from food, to English as a ssecond language, to filing their tax returns for free, to free mental health counseling, to making cancer treatment transports into Boston for them. Do you do these things because you feel guilty about voting for the likes of Ted Cruz? 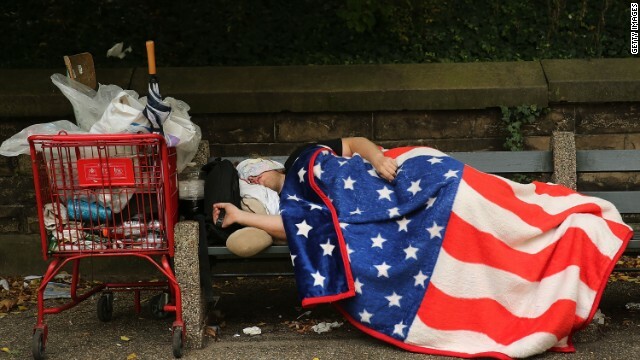 CNN, you write a smear article of the South and Christians, and yet the picture you use for support is not of some poor southern homeless man, but of someone who lives in Brooklyn, NY (that man with the American flag blanket) sleeps in Grand Army Plaza, which is right north of Prospect Park and Park Slope in Brooklyn). Let's not distort reality to push your agenda of the "benighted" right. Homeless is homeless. Location is irrelevant. Would you rather be homeless in America or North Korea? How many homeless have you tried to help? Did you know that many of them don't want your help? You can't make someone take something they don't want even if it is for their own good. Good catch and well said! Is location of the homeless more important than the fact that he is HOMELESS? Wow. Talk about splitting hairs. Way to ignore context. I generally agree. I made the point because the thrust of CNN's article is that somehow this is a problem just of Southern (conservative) states and Christians. The article is intrinsically attacking the stereotyped ideology of Christians, conservatives, and the South, which isn't fair. As the recent responders to my post indicate–homeless is homeless (not withstanding being in North Korea), but somehow CNN sees fit to ignore the plight of those in liberal New York. I point out CNNs incorrect use of the picture, to point out the inconsistency in their argument, not to comment on the plight of the homeless (regardless of where they are). Thanks for this great article CNN. About time someone exposed these hypocritical "religious" people for what they are. Pro-life?? They don't give a s$#% about human life. How is your blogging on this site helping those you claim to be so concerned about so much of the time. Get back to work, hypocrite. Just like the song Jesus never wore a Rolex or drove a Mercedes....or had an air-condition dog house. How very typical of Christians and one of the many reasons I have rebuked Christianity. And it ticks me off that they try to make the poor and sick dependent upon churches. Disgusting. These Southern preachers are in the tradition of their ancestors who used the Bible to justify slavery. Many of them are simple people who believe in the Science of Genesis which is based on the Earth being flat and having been created six thousand years ago in a six day period by a Jewish tribal God. These people FEEL and BELIEVE. They do not THINK. I hate when people bring god in there politics.Both the democrats and the republicans have it wrong no sloth and no greediness but time and time again both sides like to quote the bible when it agrees with what nonsense they are spewing at each other. This pastor is an idiot. As more Obama policies are implemented such as the UnAffordable Health Tax, the will be more and more poor people without health-care, food, jobs, housing – like Detroit. You can't tax the working people to death, save half for yourself (government), and give it to poor lazy bums and call it progress. Jesus said you would always have the poor with you, and another bible teaching is that if you don't work, you don't eat. And if you don't eat, you starve. And if you starve, that's the best motivation to get you to work. When Jesus comes back, these preaches better run for the hills, cause he is going to have his whip with him, and as before he will whip them out of the church. It is all about the money folks, people just want to protect their turf, and they think if the less fortunate are helped , then it will be taken away from them , so they live their greedy lives in fear. Not at all surprised that some of these red staters refuse ACA, but I must point out that they took better care of their slaves. You exemplify the problem pastors face in this country, you misinterpret two verses of scripture and consider the case closed on the poor. 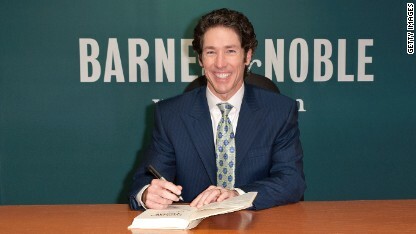 Osteen and Jakes are celebrity pastors - they cater to the wealthy and travel in high society circles. As long as their lives are cushy (outrageously so), why should they care? You are absolutely correct. These charlatan preachers only care about themselves and no one else. They refuse to confront those responsible for the problem, their own local legislatures, and call them out for it because they fear losing the political power the wield. Interesting that CNN does not point out that folks who want Obamacare can now move, but when Obama lies his way to no other options, no one will be able to escape Obamacare. 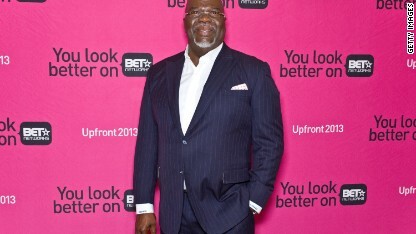 Also, it does not point out that the pro-Obama pastor is not being investigated by the IRS for engaging in politics. No surprise though because Obama uses the federal government to attack his political critics and reward his cronies. It also does not point out that religion is about the soul and not physical ailments. Of course, John Blake probably does not understand religion except to use it as a political tool or target. Obamacare in concept is flawed. More insurance and government subsidies does not fix problems created by insurance and government subsidies. Obama will not admit this though because it is contrary to his lies, and selfish goals. John Blake and CNN should be ashamed of this propaganda article, and its support for the deceit and corruption coming from the WH. Seriously, all the poor and sick have to do is to move out of state so that they can get health insurance. No offense, but that is a stupid idea that obviously was not thought through. You've hit on all of the approved daily talking points by Hannity and Rush. Yikes. First off, if you can't afford health insurance, you probably can't afford to move either. Second, Jesus said to help the sick and the needy.